Usually you'd only see a post with that title during the Blogville election season, but that was 42 dog months ago. If you read yesterday's post, you'd know the humans are getting 7 chicks that are only 2 days old on June 1st. 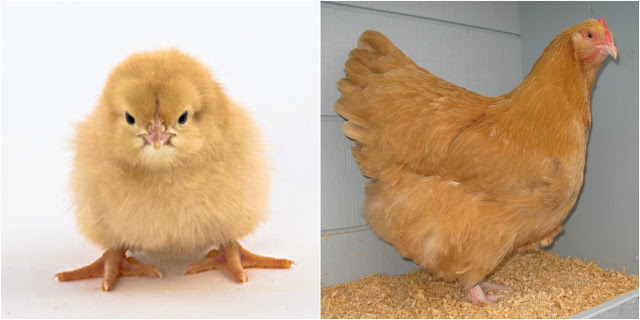 One of them, a female Buff Orpington, will belong to my mom. My mom's Orp will look like the one on the left when it first arrives, and on the right is a photo of what it will look like when it grows up. Now you have an idea of what my mom's new feathered friend will look like, but my mom hasn't officially chosen a name for the hen! Below are the two names she's choosing from. Before I mention something you guys can do, first read about why she likes each name. Aster-has a masculine sound to it, is still pretty because it is a flower, is tough, definitely very unique, and is dreamy and memorable. Saffron-it sounds unique, can be shortened to "Saffy" or "Saf", sounds feisty yet monotone. Has a slick sound to it. Aspen-sounds adventurous, fun, feisty, and is still unique. Somewhat difficult to say but sounds exotic and attractive. Jagger-sounds hardy, masculine, and is totally unique and memorable. It's easy to say, is trendy, strong, and rugged. Those are the name choices...now go to the top of my blog's right sidebar to vote on a poll of what name you like best! My mom will have it up until June 1st when the chickens arrive. Although she plans on naming her chick whichever name gets the most votes, if she thinks a different name really does suit the chick than she will not hesitate to choose one of the other names instead. It's still fun learning your opinions! Such good looking chickens. We vote for the name 'Jagger'. We have always liked that name. Have a good day. All great names. We voted! We like Aspen, but definitely go with the name that suits your chick. I was almost named Ike! That's not me at all. We cast our vote. All the names are very well thought out and with good reason. Now we will tell you why we like Aspen...the color of the adult hen reminds mom of the color of Aspen leaves in the fall. I voted for Saffron, Christmas! I am about to vote for Saffron because it is a rare and expensive seasoning that can only be harvested once a year at exactly the right stage. "Saffie" for short. I like the way Saffie (or Saffy) sounds, it's kinda cute, but I also like Aspen because she will be the same color as aspen trees. I not sure which to vote for! What are you doing with these chicks? Are you going to have laying hens? That affects the name we think! We voted!! How nice of you to let us help name your hen!! I voted! I thinks your hen is PAWSOME!!!! You are so lucky! I've voted... I like jagger maybe your chicken will get the same moves once like Mick? We like Aspen as in the Aspen groves in Colorado where Shyla lives. It reminds of of free range to roam the countryside. Your chicken will be a free range right? Sorry we don't know the difference between chickens and roosters. How about Penelope or Petunia?